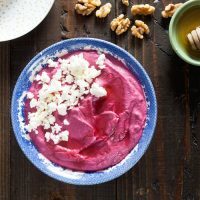 Creamy Beet Hummus with Walnuts and Feta | Healthy. Delicious. 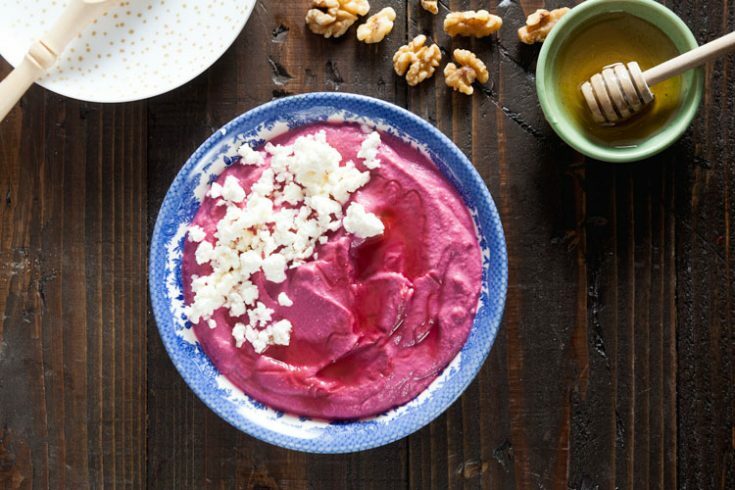 Ultra creamy beet hummus with walnuts and feta takes just 5 minutes to make in your blender. 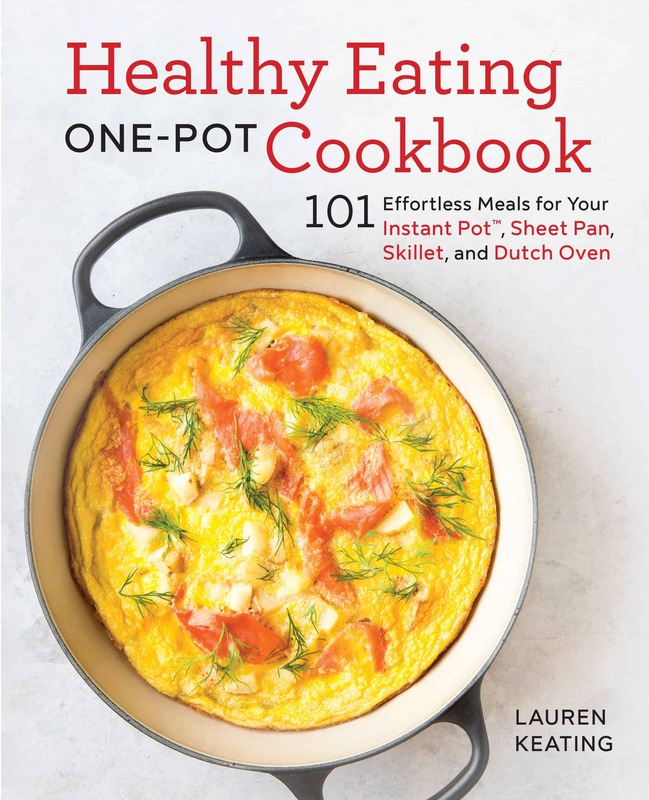 Give it a try – you’ll love it! Beets and I have been having a moment lately. Ever since I made that roast beet and citrus salad a few weeks ago, I haven’t been able to get enough of their earthy sweetness. There’s a restaurant near us that makes a beet hummus appetizer that I’m pretty much obsessed with. I can’t go there and not order it. Since it’s the kind of place that changes their menu every few months, I knew I had to recreate it at home. My version is definitely a winner – I might actually like it a teeny tiny bit better than theirs. I might have shed a few tears of joy the first time I tasted it. 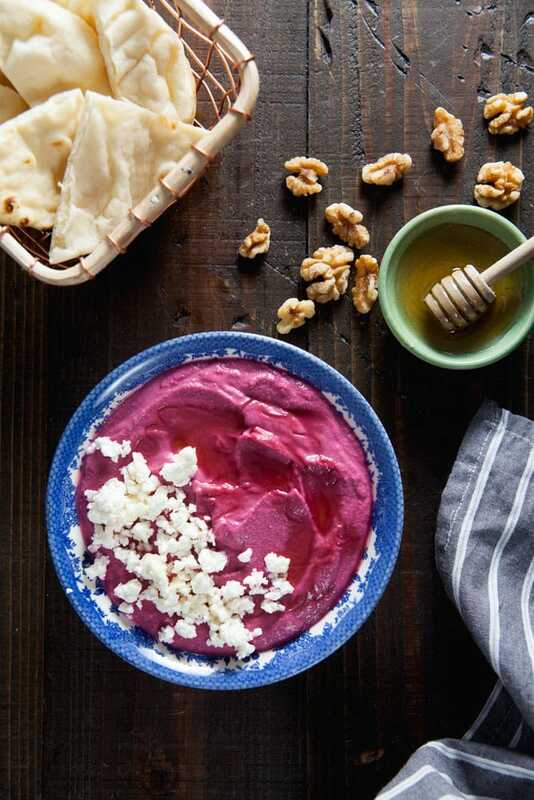 For this beet hummus, you only need a few ingredients: chickpeas, beets, feta, walnuts, lemon juice, olive oil and honey. The ingredients work together to make a dip that’s earthy, sweet, salty, and insanely creamy. 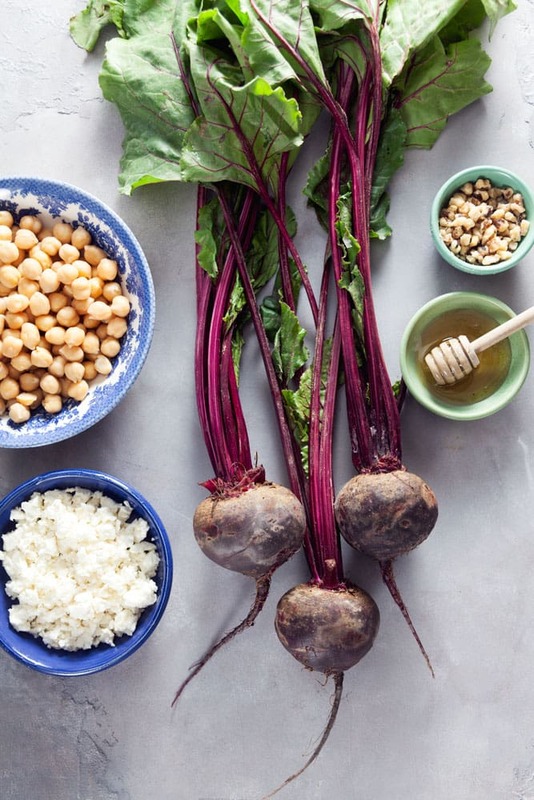 Roast beets give the hummus a deeper flavor, but if you don’t feel like messing with them you can totally use precooked beets. The steamed ones from the produce section are great, but I’ve also used canned beets with a lot of success. Add everything to your blender or food processor and blend everything together with a little water to thin it out. I use my Vitamix, and I swear it makes my hummus extra smooth. 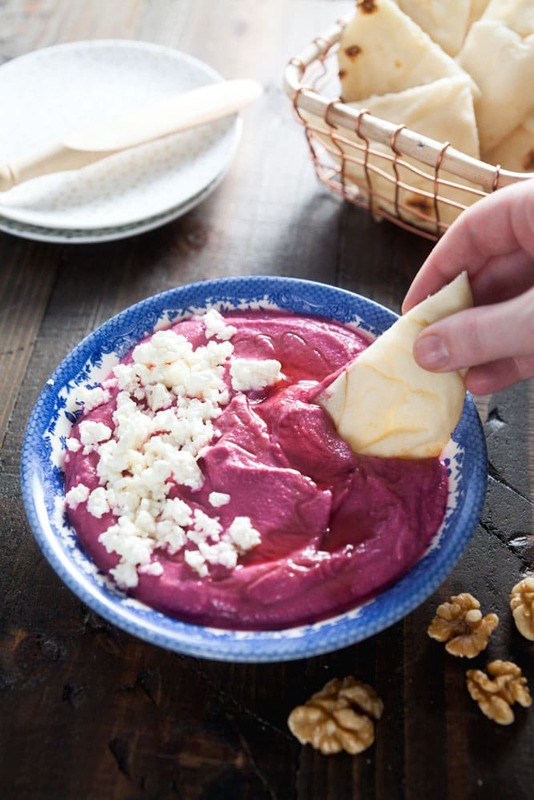 Pour the hummus into a bowl, drizzle it with a little extra honey and feta if you’re feeling sassy, and dig in! You’re going to love it. wich spread (it’s amazing with turkey on a hearty grain bread) or dollop it onto a salad. 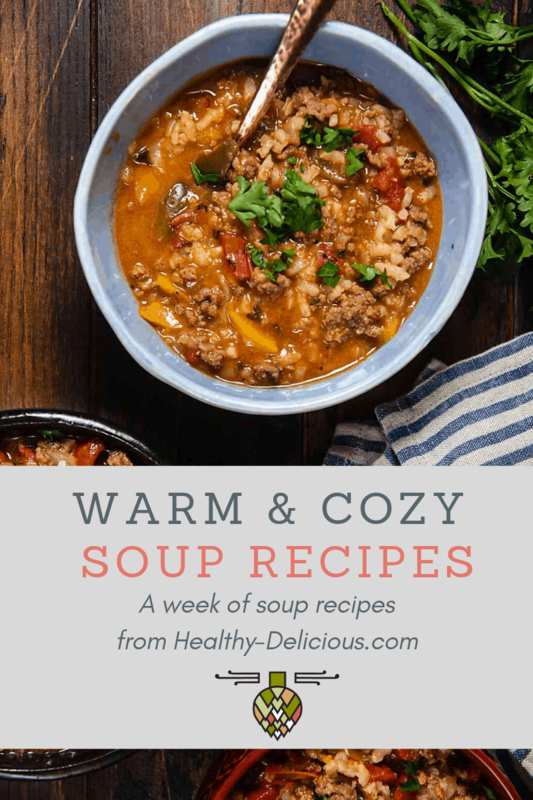 Give it a try and let me know your favorite way to eat it! Add the chickpeas, beets, walnuts, feta, honey, lemon juice, olive oil, and 1/3 cup water to a blender. Turn the blender on and gradually increase the speed to high, adding additional water as needed. Blend on high 1 minute, or until creamy. Pour the hummus into a serving dish. Drizzle with honey and top with additional feta, if desired. Serve at room temperature.